The International Rescue from the rising waters of Lake Nasser.. . . 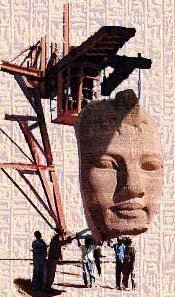 The construction of the Temple of Abu Simbel was a twenty year task. Unlike most Egyptian temples it was not erected block by block, it was carved into a mountain side. A fact that makes this temple that much more impressive.
. .The awe that modern travellers feel standing before the mountain of Ramesses II took on a new significance in the early 1960s when we used twentieth century technology to save this treasure from destruction. The temple was being threatened by the rising waters of Lake Nasser, which was formed when the Aswan High Dam was built. The mountain had to be moved. . . . . .The mountainside was cut into pieces, dismantled and moved 215 feet to higher ground where it was reconstructed into a man-made mountainside, which is supported by a large concrete dome. The measurements and layout of the temple were carefully calculated and recreated. This was done to continue a spectacular semiannual solar event that was an important part of the temples ancient design. . . . . .The moving of this temple and the smaller temple of Ramesses’s favorite Queen, the beautiful Nefertari took four years. It was carried out with financial and technical assistance from around the world. 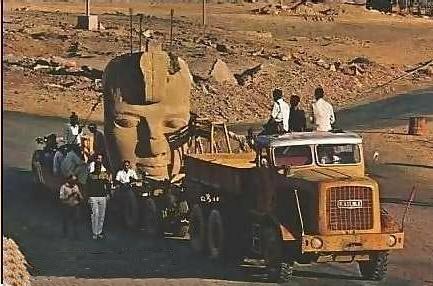 The final price tag was the equivalent of 40 million US dollars.
. . . .A scale model of the temples at Abu Simbel shows how far the temples had to be moved to get them out of the path of the rising waters of Lake Nasser. The dark waters below indicate the flood plain of the ancient Nile, while the clear plexiglass represents the surface of Lake Nasser. A hot, hazy, and humid afternoon in the worlds largest dessert. Lake Nasser seen from the International Space Station in 2005. This photo is courtesy of NASA/JPL-Caltech. 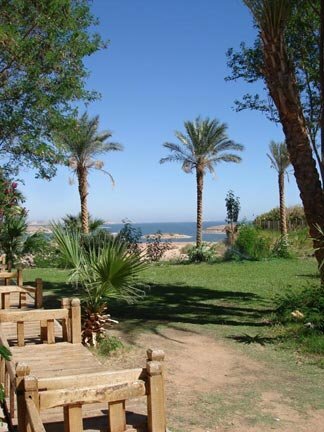 A shade oasis overlooking Lake Nasser. high enough to flow into the spillway known as the Sadat Canel. It now flows into the western dessert and is creating the Toshka Lakes.